The Greek myth of Oedipus inspired many artists from the antiquity till today. In the early 19th century, enamel miniature painters found inspiration in many classical subject ranging from copies of famous paintings to Greek mythology as in this pocket watch. 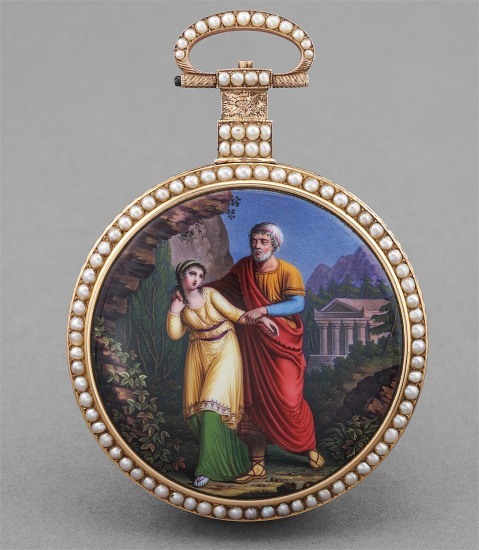 The scene on this watch depicts the old and blind Oedipus wandering around Thebes with his daughter Antigone and could be seen as a symbol of filial piety or dutiful loyalty. William Ilbery was one of the most renowned British watchmaker of his time. He was active in London from circa 1780 to 1839. Although he worked mainly in London, Ilbery maintained close contact with trade in other countries. In particular, Ilbery was remembered for his production of luxurious enamel pocket watches in gold for the Chinese market where they were highly coveted. These pocket watches were adorned with small round pearls on the face and caseback and exquisite enamel miniature paintings on the cases. Most of these pocket watches depicted floral arrangements, domestic scenes, classical paintings with only a few inspired by scenes from Greek mythology. Ilbery had the most elaborated cases of his watches decorated by the best Geneva enamellers such as Jean-François-Victor Dupont and Jean-Louis Richter. Like all his pocket watches, the present example is endowed with a traditional English style movement with full plate and duplex escapement which in itself is a showcase for fine craftsmanship with its superbly hand engraved decoration. The calibre is further protected by a double caseback, which, like a butterfly, displays even more marvels when it opens its wings. Preserved in superb overall condition, the present watch with its fine enamel miniature paintings and its unusual theme will be as coveted by today’s discerning collectors as in China in the 19th century.